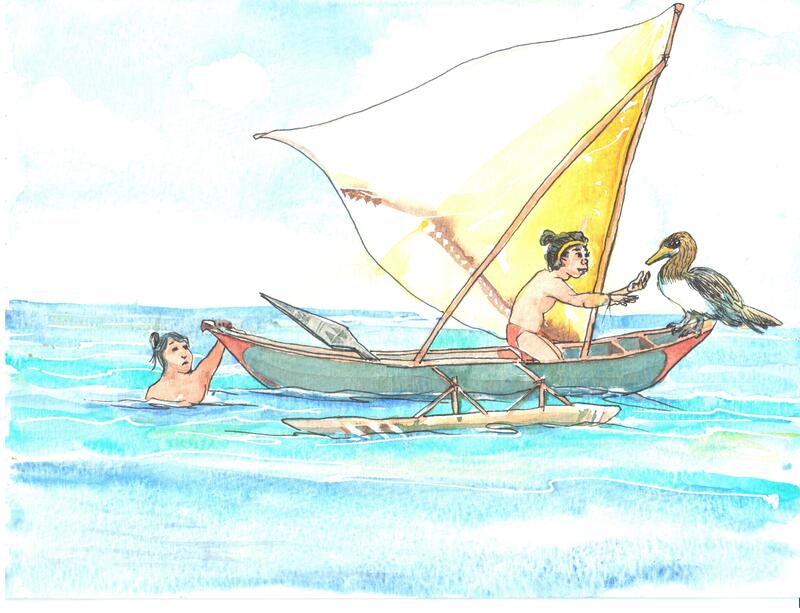 I started working on this project last year, when a grant was submitted to produce a collection of Chuukese folk tales gathered from the Chuukese community in Honolulu. Palama Settlement, where I volunteer and lead a keiki After School Enrichment watercolor program has been meeting the challenges to support their community over the past century. Hawai’i is a place where many immigrants have landed on these shores, some by choice, some feeling like this was their only choice for a better life for their family. Each major group has left it’s mark on history and the islands’ culture. The Hawaiian archipelago is about 1500 miles long with about 162 islands of which over 1 million live on 7 of them. Chuukese come from the Federation of Micronesia which is 1800 miles long with over 600 islands and a total population of just over 100,000. These stories were collected from the community and represent the various islands our new neighbors in Hawai’i come from. Many growing up will not get to visit where their families originated from–so these stories are preserved in English and Chuukese to show pride in a culture and history that now joins with modern Hawaiian history. As a 4th generation Japanese-American–depending on how you count–since my great grandparents actually emigrated to the Kingdom of Hawai’i, not the Republic of or Territory of Hawai’i…I stand on the other end of the immigrant’s journey benefitting from all the sacrifices my family made for us. I also got to experience being a 1st gen immigrant—as an American moving to Sweden, and so my heart really aches for and goes out to new immigrants, such as the Chuukese gathering in Hawai’i. King Kalakaua welcomed the Japanese laborers and their families–hoping that there would be a blending of the races to bring forth a stronger people holding on the good values of each as they faced the future. Prince Kuhio also welcomed those who had made Hawai’i their home despite the turmoil over annexation. He also looked to the people of blended families to lead Hawaiians forward into the new century and beyond. 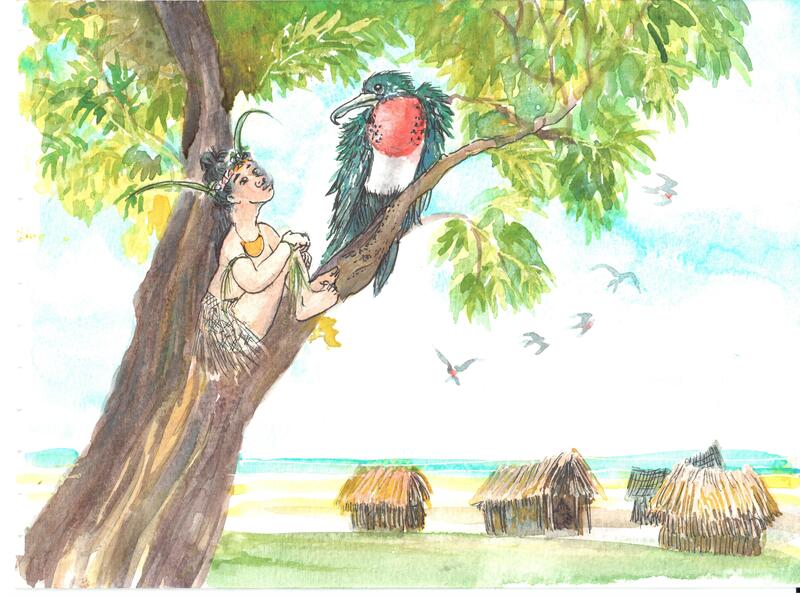 I’ve tried to infuse the illustrations with my sense of the longing for their islands. This comes in the telling of these stories by those who know them well to the younger children, who will grow up in at least 2 cultures. The languages…English and Chuukese, side by side, in the text show that both languages can be used to tell their stories to each other and also for the rest of us. This folktale about an impatient boy is classic. Eol and Eot illustration in watercolor and pigment ink. Copyright Dawn Yoshimura 2018. Eol and Eot storyboard illustration using watercolor and pigment ink. These stories were collected from the community and represent the various islands our new neighbors in Hawai'i come from. 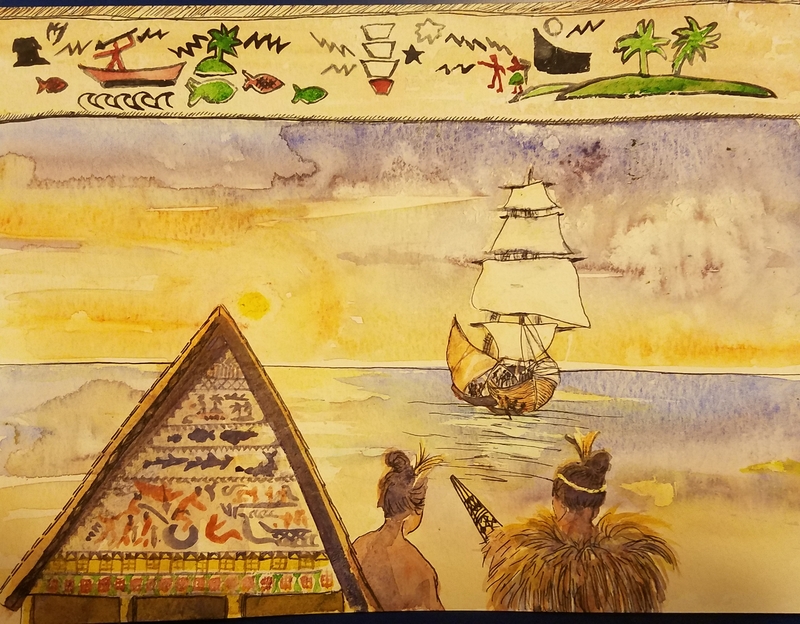 Many growing up will not get to visit where their families originated from--so these stories are preserved in English and Chuukese to show pride in a culture and history that now joins with modern Hawaiian history. Copyright Dawn Yoshimura 2018. Watercolor with pigment ink on paper. 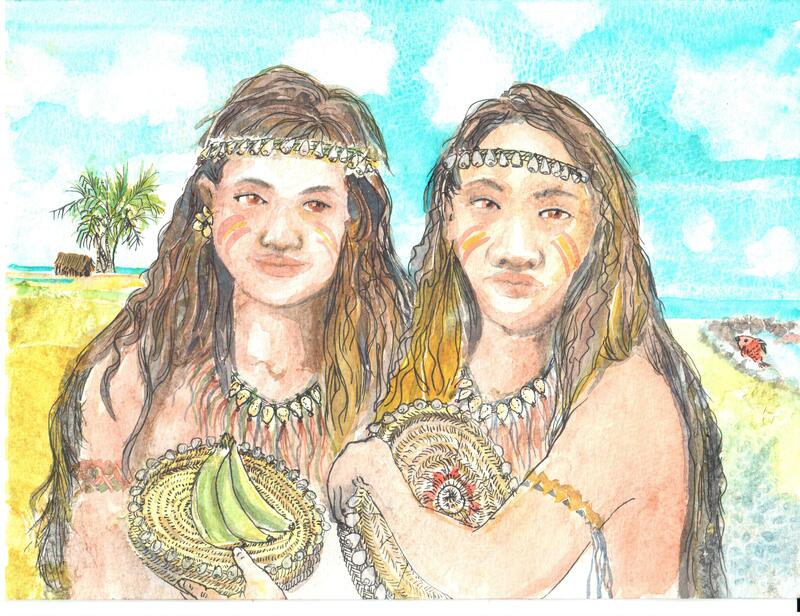 Illustration from How Christianity Came to Chuuk, book project by Palama Settlement. Chuukese come from the Federation of Micronesia which is 1800 miles long with over 600 islands and a total population of just over 100,000. The Hawaiian archipelago is about 1500 miles long with about 162 islands of which over 1 million live on 7 of them. The book will come out in the fall and be distributed through schools and libraries and community storytelling events.